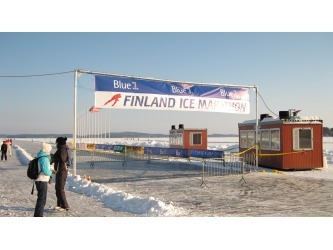 Finland Ice Marathon 2009 at Kuopio, Finland on Lake Kallavesi. 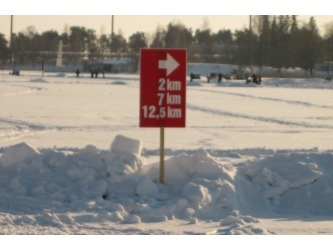 A variety of distance skating events including a marathon of 200km. Vikingarännet 2009. 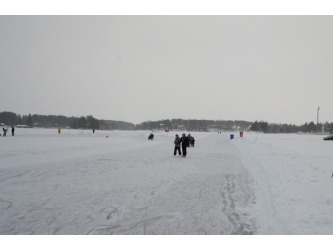 A 80km (50 mile) tour skate north of Stockholm, Sweden. View the slideshow below, or you may have better luck with this URL at http://www.flickr.com/photos/35710734@N05/sets/72157614430280060/show/ (and then click the Show Info tab to see the captions). On the ice reports map from February 2009 below, the numbers indicate ice thickness in cm, while the jagged line is a warning of a major crack and the waves are a caution about open water. There were about 3,000 participants in the race plus a multitude of volunteers running the race. 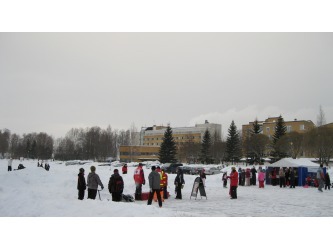 A little more than half of the participants skated with ice poles (pik / stav), that looked like ski poles except they have a sharp point for testing the ice thickness; all participants were required to have ice claws / ice prods, which are two small screwdriver looking things that help one get back on the ice if it breaks and they were to fall in. 2003 4th Alternative 11 City Race at Lake Akan, Hokkaido Japan. 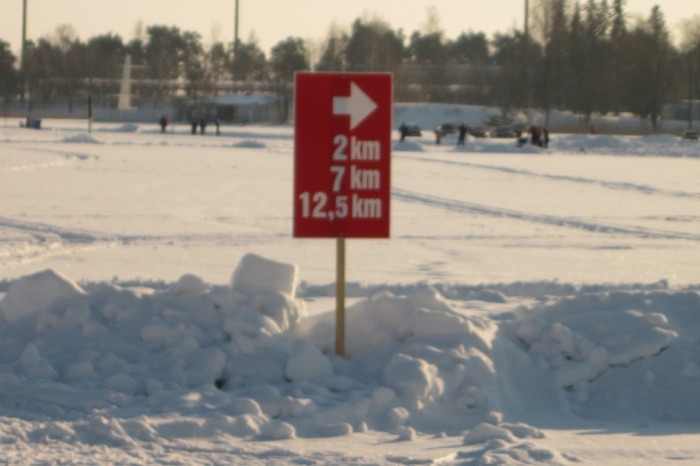 The 200km tour consisted of 20 laps around a 10km loop, part of which is fainlty visible in one of the photos below (the small oval in the foreground was not used in the race). 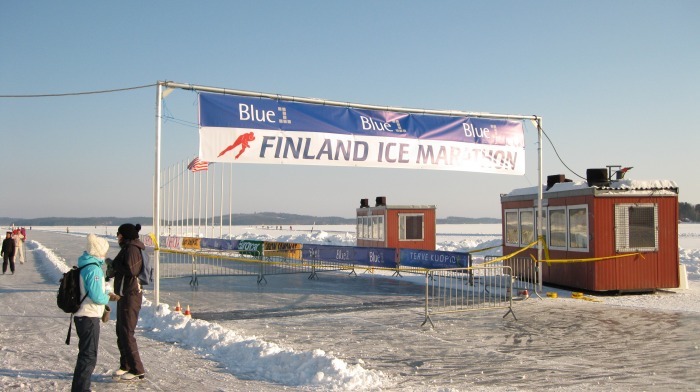 Skating in the 200km tour. I skated in Salomon cross-country ski boots with a nordic skate blade. 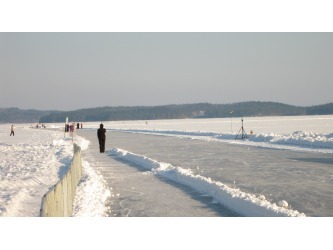 While the surface was pretty smooth, some of the skaters in traditional speedskates had to contend with their blade occasionally getting caught in deep ruts. Amsterdam in 1996. While to the north in Friesland, the canals have a better chance of freezing, the boat traffic and other reasons mean that the canals rarely freeze solid enough for skating in Amsterdam. 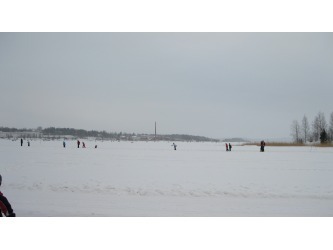 It hadn't frozen solid for 6 years when I was there so it was a very special event and the day I skated there, the kids got a holiday from school and many adults took the day off or were given vacation. 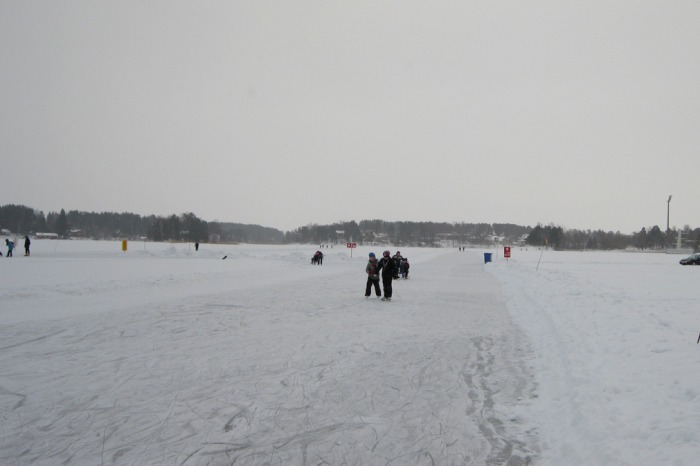 A variety of people came out to skate or walk on the frozen canals. Dutch version of lemonade stand. In Amsterdam when the canals freeze, dogs and children get to go skating too. The old central city in Amsterdam is comprised of a system of canals that makes for a fun day of exploring if you are lucky enough to be there when the ice is solid enough. Friesland canals. It didn't get quite cold enough for an Elfstedentocht in early 1996 when these photos were taken, but there were a lot of skaters out. The area reminded me of northern Illinois in that the topography was flat, punctuated by farms as well as the occasional town or city. The big differences that I noticed were the occasional windmill and that the houses had ceramic tile roofs. A tour in the Leeuwarden area. 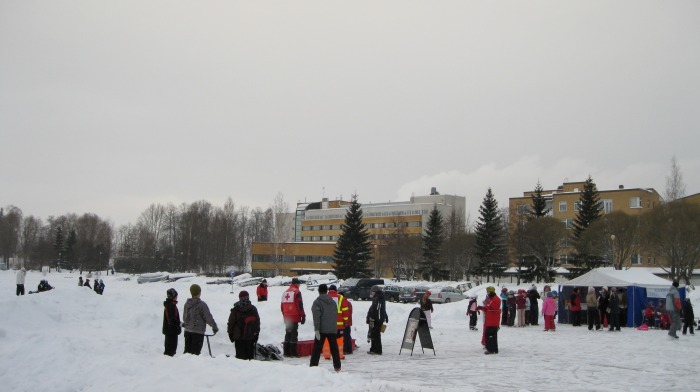 The skaters slow to a stop in the photo as they are approaching a checkpoint where they will get their tour cards stamped. 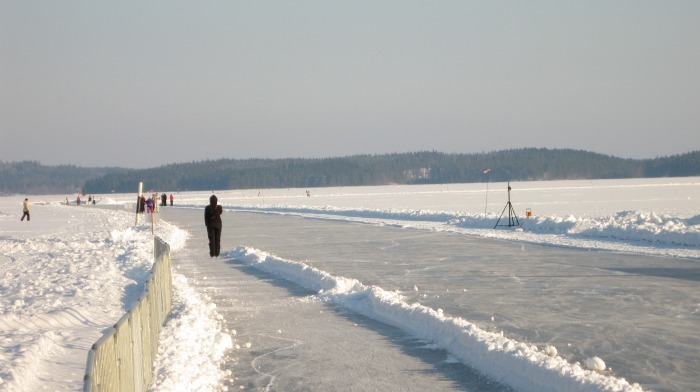 Carpets and sheets of plywood were put down for the skaters to "klune", or portage in the their skates around areas where the ice wasn't solid enough under one of the bridges. 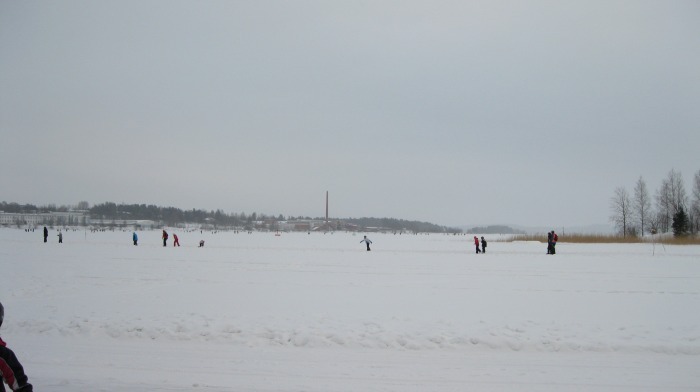 In the center of the photo are a pair of wooden shoes someone wore to the canal before changing into ice skates. For an American tourist, wooden shoes and canal skating in the same photo is special--the only thing missing was the windmill. At one place the canal opened into a small lake I did find this small windmill, but not the classic large windmill.